Home / Templates and Themes / Retro Revival !!! 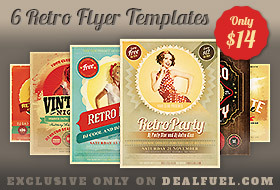 Advertise or promote your work with these 6 Retro Style high quality PhotoShop print templates! Design your next party or project with these Simple & Quick to Customize templates. Cannot make them avalilable for free. Ready to grab these Retro Flyers for just $14 Today? Enter your Name, Email & click ‘Buy Now’ button below. You will be redirected to the payment page. Fill the necessary info and make the payment.